The northern bobwhite quail (Colinus virginianus) lives in open areas in and around forests as well as in grassy meadows and other open fields that provide enough cover and food for this little bird to survive. This quail does not adapt well to human encroachment. Its nesting season is often disturbed by human activities such as farming, resulting in the species being threatened in some parts of the country. The bobwhite quail needs a suitable environment in which to thrive and reproduce. These birds spend much of their time on the ground, foraging for seeds and insects among the cover that native grasses provide. Bobwhites are disappearing as small farms are taken over by large farms that use more intensive farming methods, especially spraying and heavy tilling. 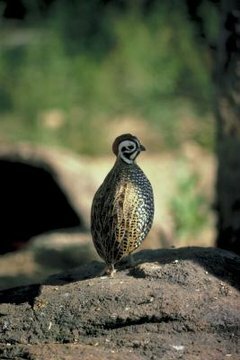 The quail also can’t live in heavily forested areas. Male and female bobwhite quail get together at the beginning of breeding season, anywhere from early May through the end of September. The female lays between 12 and 18 tiny white eggs in a nest built on the ground, then settles down to incubate them. Her mate helps her and takes turns keeping the eggs warm for the 24-day incubation period. Once the babies hatch both parents care for them. Bobwhite quail begin to hatch in June. Once the babies are dry they leave the nest and head off into the surrounding cover. They stay close to their parents, sheltering under the adults when it rains and scratching for food when the weather is good. First feathers come in when they’re about 2 weeks old, and by the time the babies are 2 months old they’re beginning to get adult feathers. They rely on their parents to safeguard them until they are 5 weeks old, after which they may stay together but the young are much more independent. By late fall the bobwhite quail have organized themselves into coveys that may or may not contain related birds. Each covey has a range that includes plenty of food and cover to support the size of the covey. If a covey gets too small its members will merge with another group so that coveys tend to remain the same size throughout the year. The birds huddle together on cold nights and forage in their range during the day. In spring the cycle begins again. Bobwhite quail face many different threats during the course of their lives. Since their nests are on the ground, both the eggs and young birds are an easy meal for snakes, skunks, dogs and raccoons. The parents may fall victim to any of these predators as well. Quail also must fear humans, since these birds are a favorite target of many hunters; bobwhites are the No. 1 choice of bird hunters in states such as Indiana, where large numbers of quail are shot every year.